R.4.G.1 | R.4.G.1 (En Español) Explore and verify the properties of quadrilaterals. R.4.G.3 | R.4.G.3 (En Español) Identify and explain why figures tessellate. R.4.G.4 | R.4.G.4 (En Español) Identify the attributes of the five Platonic Solids. R.4.G.5 | R.4.G.5 (En Español) Investigate and use the properties of angles (central and inscribed) arcs, chords, tangents, and secants to solve problems involving circles. R.4.G.6 Solve problems using inscribed and circumscribed figures. R.4.G.7 | R.4.G.7 (En Espanol) Use orthographic drawings ( top, front, side) and isometric drawings (corner) to represent three-dimensional objects. R.4.G.8 Draw, examine, and classify cross-sections of three-dimensional objects. 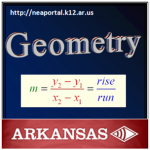 R.4.G.9 Explore non-Euclidean geometries, such as spherical geometry and identify its unique properties which result from a change in the parallel postulate.